Donovan Mitchell has been carrying a historically high offensive load for the Jazz. How’s he holding up? 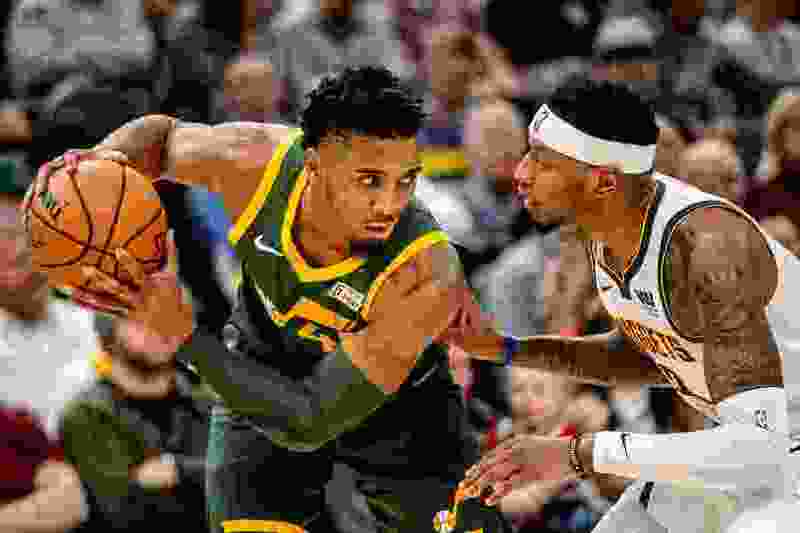 (Trent Nelson | The Salt Lake Tribune) Utah Jazz guard Donovan Mitchell (45) defended by Denver Nuggets forward Torrey Craig (3) as the Utah Jazz host the Denver Nuggets, NBA basketball in Salt Lake City on Wednesday Jan. 23, 2019. For a second-year player, Donovan Mitchell is carrying quite the load. Right now, Mitchell ranks sixth in the NBA with a 31.4 percent usage percentage: that is, the frequency of the Jazz’s possessions that end in a Mitchell shot, a trip to the line, or a turnover. To give you an idea of how that compares with the rest of the league’s stars, that puts him just behind Giannis Antetokounmpo, but ahead of LeBron James in the leaderboard. James Harden, of course, ranks first with a 40.2 percent usage. When you compare it to rookies or sophomores in NBA history, only one player surpasses Mitchell: Philadelphia’s Joel Embiid. Michael Jordan was on his way to a higher usage percentage in his second year but missed most of that season due to a broken foot. That’s the list. Watch the Jazz play, and you’ll notice right away just how frequently coach Quin Snyder’s offense asks Mitchell to run the show: using screens, making plays for himself and others. Does Mitchell feel the weight of that on his shoulders? “Definitely. There are times when you feel like ‘Man, I’m doing a lot.’ But it’s part of the job. There’s no need to sit there and think ‘Man, I’m tired’ or this or that, you don’t have room for that,” Mitchell said. To deal with the stress carrying the Jazz’s offense puts on his body, Mitchell has to work with the Jazz’s training staff very frequently. Take Saturday, for example: After a win over the Atlanta Hawks the night before, Mitchell came back to the Zions Bank Basketball Campus in the morning to get recovery work done by Jazz performance staff, under the direction of Mike Elliott. Then, he arrived at the arena early, before the team’s walkthrough at 4 p.m., to get even more treatment to prepare himself for the Rockets. For his part, Snyder does what he can to manage Mitchell’s minutes given his load on the floor. That’s true. Harden, for example, leads the NBA by playing 37.5 minutes per game, while LeBron James has played 34.8. Milwaukee coach Mike Budenholzer has done a good job limiting Antetokounmpo’s minutes; he averages just 33.1 per game, while Mitchell is at 33.2, good for 38th in the NBA. Perhaps that shared philosophy is no coincidence, given Snyder’s history of working with Budenholzer. Snyder is also conscious of limiting the length of Mitchell’s stints on the floor. For the most part, Snyder tries to keep him to nine to 10 minute stretches without getting a substitute in the game. After Mitchell missed two games in November, Snyder limited him to six-minute stints in order to keep the load off. “Those longer stretches we have to be aware of. I do believe for Donovan in the course of the game, him being fresher allows him to attack,” he said. There are times, though, when Mitchell is so in control of the game, so on fire, that the Jazz have to figure out ways to keep him out there. Take Mitchell’s breakout game against Detroit: He played the final 19:19 of that contest. But Snyder called timeout at the 8:51, 6:30 and 2:45 marks of the fourth quarter to give Mitchell a break even when the game didn’t call for a timeout, while the Pistons called one at 4:37 in response to the baskets Mitchell was creating. In other words, Mitchell got a 75-second break every two minutes or so. Oh, and his stellar play allowed the Jazz to turn an 11-point third-quarter deficit into a five-point win.